If the Base value or Exponent value argument is not a number, POW() function will return NaN. If the Base value or Exponent value argument is Null, POW() function will return Zero. First three statements, We used the POW() Function directly on both the Positive integer and negative integer. 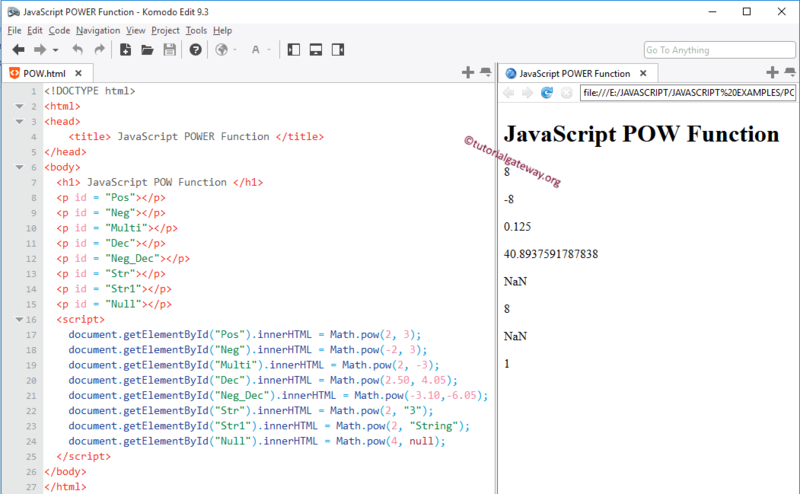 From the above screenshot you can observe that, POW() Function is returning output. Next, We used the POW() Function on both the Positive and negative decimal values. From the above screenshot you can observe that, POW() Function is returning NaN (Not a Number) as output for negative values. Last, we used POW() Function along with Null value. Here null argument is converted to Zero.